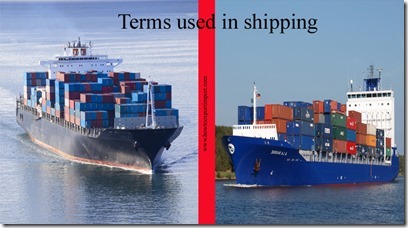 Terms used in shipping such as Container,Container,container chassis,container crane,Container leasing etc. This post explains about terms used in shipping such as Cont.,Consumption Entry,Container,Container,container chassis,container crane,Container leasing,Container Load Plan,Container Pool etc. These terms used in international business are arranged in alphabetical order and you may add more information about terms used in export business at the end of this article, if you wish. Consultative Group on International Agricultural Research - CGIAR, an informal association of public and private sector donors, supports international agricultural research centers (IARCs) around the world. The centers develop new ways to increase sustainable food production and improve the nutritional and economic well-being of low-income people. CGIAR, sponsored by the World Bank and other international organizations, was established in 1971; its Secretariat is in Washington, D.C. The research centers include: - Centro Internacional de Agricultura Tropical (CIAT), Colombia - Centro Internacional de Mejoramiento de Maiz y Trigo (CIMMYT), Mexico - International Board for Plant Genetic Resources (IBPGR), Italy - International Center for Agricultural Research in Dry Areas (ICARDA), Syria - International Centre for Research in Forestry (ICRAF), Kenya - International Crops Research Institute for the Semi-Arid Tropics (ICRISAT), India - International Food Policy Research Institute (IFPRI), United States - International Irrigation Management Institute (IIMI), Sri Lanka - International Institute of Tropical Agriculture (IITA), Nigeria - International Livestock Center for Africa (ILCA), Ethiopia - International Laboratory for Research on Animal Diseases (ILRAD), Kenya - International Network for the Improvement of Banana and Plantain (INIBAP), France - International Rice Research Institute (IRRI), Philippines - International Service for National Agricultural Research (ISNAR), Netherlands and - West Africa Rice Development Association (WARDA), C"te d'Ivoire. Consumption Entry (CE):The process of declaring the importation of foreign-made goods into the United States for use in the United States. Contadora Group - The Contadora Group, which first met on the Panamanian island of Contadora in January 1983, seeks solutions to conflict in Central America. Members include the foreign ministers of Colombia, Mexico, Panama, and Venezuela. Group headquarters are in Mexico City, Mexico. Container - a reusable steel rectangular box for carrying cargo that first came into common use about 50 years ago. The sizes of containers are standardized so that they can easily be moved between specially adapted containers ships, trains and trucks. Container - A uniform, sealed, reusable metal "box" in which merchandise is shipped by vessel, truck, or rail. Standard lengths include 10, 20, 30, and 40 feet (40 foot lengths are generally able to hold about 40,000 pounds). Containers of 45 and 48 feet are also used, as well as containers for shipment by air. container - Box, in several standard sizes, designed to enable goods to be sent several places without the contents being touched. CONTAINER (OCEAN):(1) Designed to be moved inland on its own chassis, an ocean container can be loaded at the shipper’s plant for shipment overseas. The average outside dimensions are generally 20, 35, and 40 feet in length, 8 feet wide, and 8 feet high. (2) A van, flatrack, open top trailer or other similar trailer body on or into which cargo is loaded and transported without chassis aboard ocean vessels; a large rectangular or square container/box of a strong structure that can withstand continuous rough handling from ship to shore and back. It opens from one side to allow cargo to be stacked and stowed into it. Container : A reusable steel rectangular box for carrying cargo that first came into common use about 50 years ago. The sizes of containers are standardized so that they can easily be moved between specially adapted containers ships, trains and trucks. Container Booking:Arrangements with a steamship line to transport containerized cargo. container chassis: A piece of equipment specifically designed for the movement of containers by highway to and from container terminals. container crane: Usually, a rail-mounted gantry crane located on a wharf for the purpose of loading and unloading containers on vessels. Container depot (Inland depot): The plot for collecting, keeping, piling or taking over empty containers. It is established in case of inadequate yards in loading area or transfer station, and does not handle the take-over of containers or goods. It can be established independently or outside the loading area. The management of this kind of pool should apply to shipping consortia in some countries. Container Freight Station (CFS or C.F.S. ):Consolidation depots where parcels of cargo are grouped and loaded into containers. Alternatively, inbound cargoes in a container are devanned for deliveries to consignees as LCLs. Container Freight Station (CFS) - It is the facility in ocean carrier where the goods are received by carrier for loading into containers or unloading from it and the carrier may also assemble, hold, or store its containers or trailers in the place. container freight station: The facility for stuffing and stripping a container of its cargo, especially for movement by railroad. Container Freight Station:Facility that consolidates less than container load (LCL) shipments for shipment in containers. Also, breaks down LCL loads and makes them available to consignees. These facilities can be located in container yards, or off dock. Container Gross Weight:Refer to “Gross Weight”. Container Leasing / Railcar Leasing:Some companies specialize in the business of owning transportation equipment (containers or railcars), and renting them out to shippers or carriers. These companies often face significant equipment management problems. Container leasing :It refers to the type of business that the possessor leases empty containers to the user. The possessor of containers, the lessor, signs lease contract with the user, or the lessee, which is usually the vessel company or consignor. The lessor provides qualified containers to the lessee for the use in appointed range. There are various ways of the leasing of containers in the world, including run lease, period lease, current lease and navigation area lease. Container Load Plan (CLP):A document prepared to show all details of cargoes loaded in a container, e.g. weight (individual and total), measurement, markings, shippers, consignees, the origin and destination of goods, and location of cargo within the container. A Container Load Plan is either prepared by the cargo consolidator or the shipper which ships its cargoes on FCL terms. Container Load:A load sufficient in size to fill a container either by cubic measurement or by weight. Container Manifest:Vessel sailing between two points must by law have a container manifest that shows various details about each container the ship is carrying. Information includes point of origin, point of destination, and a detailed summary of the total cargo in each container. Container Number:The unique identification of a container. Container on Flat Car (COFC)- A container placed directly on a railroad flatcar without chassis. Container Pool:Stock of containers pooled by various container carriers and made available to local shippers. The purpose of the pool is to allow efficient use and supply of containers.